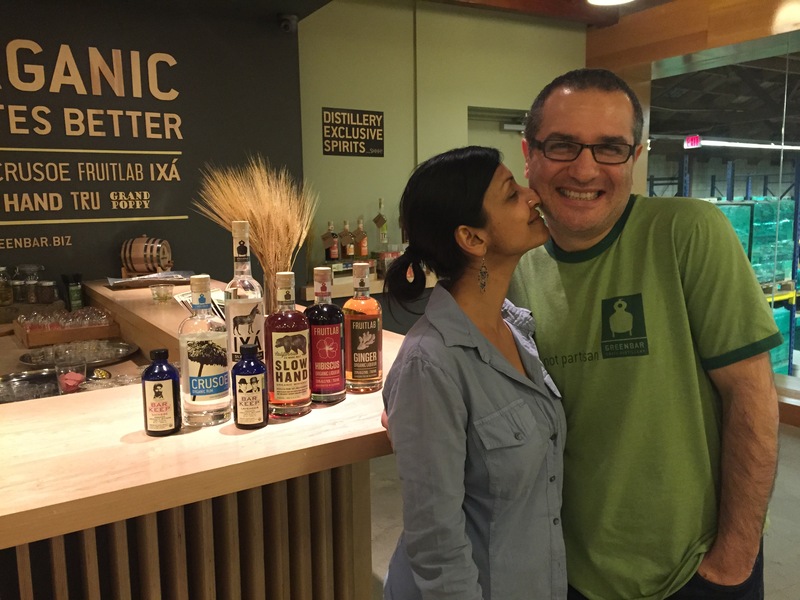 Greenbar Craft Distillery was officially founded in 2004 by husband-and-wife team Melkon Khosrovian and Litty Mathew. 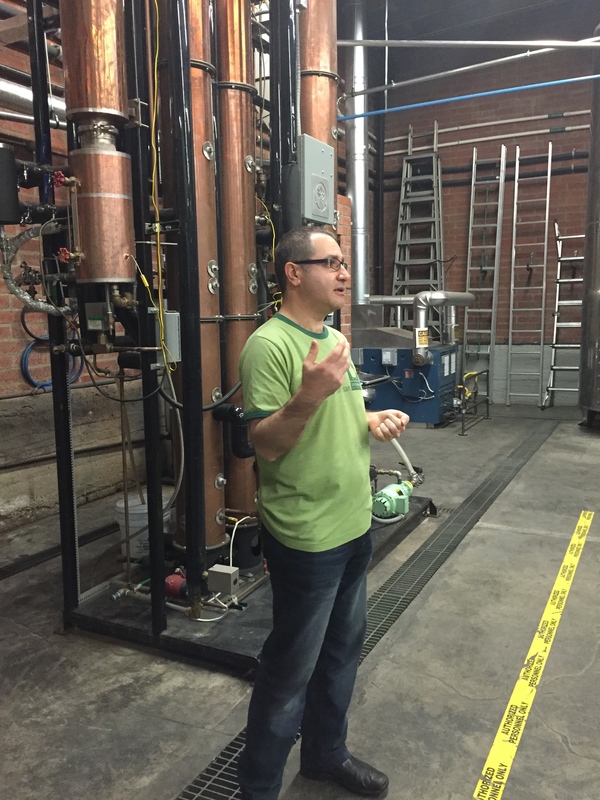 But the story of this pioneering Los Angeles distillery began several years earlier. After getting engaged, Melkon began infusing vodka with fresh fruit from his local farmers market to create custom libations that Litty could enjoy during family gatherings. Melkon’s artful concoctions quickly earned the praise of friends and family who began requesting bottles of the quaff for themselves. Eventually, the pair formed Modern Spirits (later renamed Greenbar) which was one of only 38 micro distilleries in the United States at the time. Now, a decade later, there are over 700 micro distilleries in the U.S. and Greenbar remains true to its mission. Greenbar’s commitment to real ingredients that impart authentic flavor is impressive and all-consuming. No liquid smoke and mirrors. No shelf-stable, artifical fruit substitutes. And no short cuts. “We don’t buy flavors, we make flavors,” boasts Melkon. The team at Greenbar hand slices 5,000 vanilla beans for their TRU Vanilla Vodka to ensure the elixir actually tastes like its namesake ingredient. And for each 1,000 gallon batch of TRU Lemon Vodka they hand zest over 2,000 lemons to avoid piercing the bitter pith that can ruin the flavor balance. But this unwavering pursuit of authenticity comes with its own set of challenges. Working with seasonal, agricultural products that vary from season-to-season, and farm-to-farm, the company must closely monitor every batch of its spirits to ensure flavor consistency over time. Acknowledging the impossibility of this task, Melkon targets 95% consistency across every batch, leaving 3% for accidental magic and 2% for continual product improvements. Reminiscent of the couple’s early days of infusing vodka, Greenbar has also taken a novel path to whiskey making. The company’s Slow Hand Six Wood Whiskey achieves its unique flavor and aroma from a variety of exotic woods introduced during the aging process. 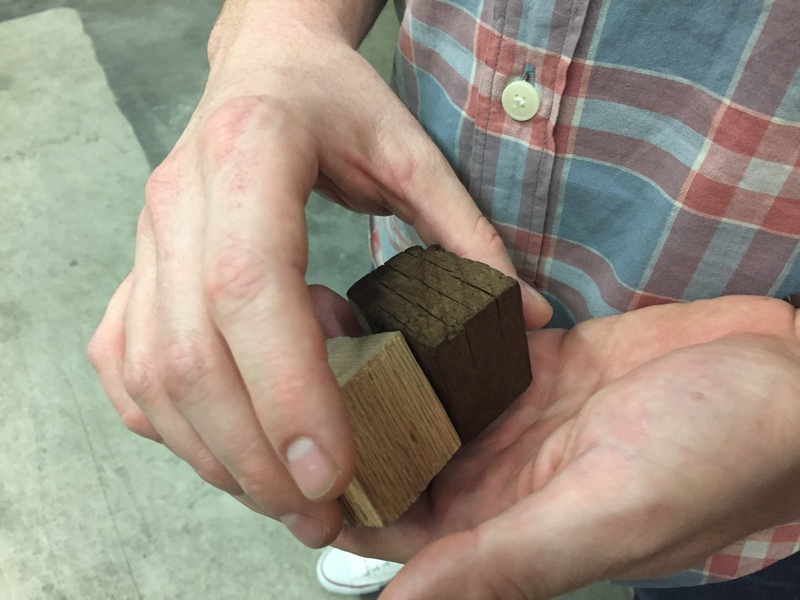 Maple, mulberry, hickory and other woods are cut into 2” cubes and toasted in-house, then steeped like tea with the whiskey inside a 1,000 gallon French white oak barrel. The titanic oak barrel is just one of many reasons why the company claims to have the most state-of-the-art fermentation and distillation system in the industry. A system which has been carefully designed and tuned to give the makers unparalleled control over every parameter in the process. The pièce de résistance of the entire operation is the one-of-a-kind fractionating continuous column still used for primary distillation. The large, steampunk-ish contraption can hold a constant temperature throughout the distillation process, allowing the makers to isolate specific flavors that exist in the mash and pull them out into the final product. Melkon is passionate in defending his view of craft spirits. “Craft is a maker with an original thought, the skills to put that idea into a bottle and who is involved in every step of the process. Craft requires a maker. No maker, no craft. No original idea, no craft.” But in the end, Melkon insists that he is still just trying to create products that please his discriminating wife. This is all evidence that Greenbar’s value to the spirits industry is without question the exploration of new ideas. Their products are pricier and harder-to-find than their mass-production counterparts, but what mega-distillery is brave enough to gamble on producing a poppy liqueur? Greenbar claims the world’s largest portfolio of organic, handcrafted spirits, including BAR KEEP organic bitters, CRUSOE organic rums, FRUITLAB organic liqueurs, IXÁ organic tequila, SLOW HAND Six Woods organic whiskey, GRAND POPPY Bitter Liqueur, TRU organic gin and TRU organic vodkas. Tasting Room Manager Drew Jacobson (who has a very famous father that sometimes drinks beer) took me on a tasting tour of Greenbar’s more ambitious creations. Inspired by a weekend walk through Griffith Park, Grand Poppy captures the essence of the California poppies, pink peppercorns and other native botanicals that grow along the sunny hillside. Technically a fruit Brandy, this aperitif is infused with both fresh and dry ingredients. A delicate balance of bitter sweet, Grand Poppy bursts with intense flavors of flowers, roots, herbs and citrus. This organic whiskey is distilled from 100% malted barley and aged in a 1,000 gallon oak barrel along with toasted cubes of other exotic woods. Greenbar’s unorthodox aging process ultimately results in a spectacularly unique spirit. The aroma is complex with hints maple syrup, butterscotch, vanilla and curry. The flavor is surprisingly smooth and well-rounded with a symphony of faint woody notes that add up to a very approachable whiskey. Flavor infused vodkas is what started it all. At a time when the over-saturated world of premium vodkas fall into two classes: hyper-distilled flavorless tipple and super-sugary artificial fruit bombs, the Greenbar’s TRU Vodka lineup stands apart. Using only fresh ingredients, each vodka tastes like it was born at the local farmers market. The Garden vodka, infused with fresh celery, dill, fennel, thyme and other salad toppers, is one of the team’s more unique expressions. Add a smidgen of Dry Vermouth and an olive and you’ve got a breakfast martini if there ever was one.